Japanese artist Aisuke Kondo (left) presented work from his Diaspora Memoria exhibition. “In doing research about your own history, you come to see how the larger societal history has developed,” Kondo said last week in a talk hosted by UC Santa Barbara’s Theater and Dance department. The exhibition explores his great-grandfather’s life, from his immigration to the U.S. to his internment at Topaz internment camp in Millard County, Utah, and what it means for Kondo’s identity. It has been shown in Los Angeles, Berlin and Japan. Featured in the exhibition are artifacts that Kondo found while visiting the places his great-grandfather had stayed, as well as photos that had been passed down to him. Pictured above are pottery shards that Kondo's great-grandfather wrote on while in the Topaz internment camp in Utah. Kondo, born and raised in Japan, was originally inspired to create this body of work while attending art school in Berlin. He worked there as a part time hotel cleaner and started to think about his blue collar identity, and that of his great-grandfather, who worked as a dry cleaner after immigrating to San Francisco. It made him wonder about his great-grandfather’s life in the U.S., having only heard stories from his grandmother, who often pointed out the physical similarities between him and his great-grandfather, such as the shape of their eyebrows. “This, in a mysterious way, created a sort of connection and feeling of intimacy between us,” Kondo said. In Berlin during the 2011 Fukushima nuclear disaster, he started thinking about the Hiroshima and Nagasaki bombings and wondered how his great-grandfather reacted, while he was interned in the U.S. Kondo realized that he unconsciously followed in his great-grandfather’s footsteps becoming a migrant overseas when he moved to Berlin. “It got me thinking about the influence of the past in contemporary society,” he said. This inspired Kondo to retrace his great-grandfather’s steps. He started by visiting San Francisco where his great-grandfather lived for 47 years. He created videos showcasing all the places his great-grandfather had been. 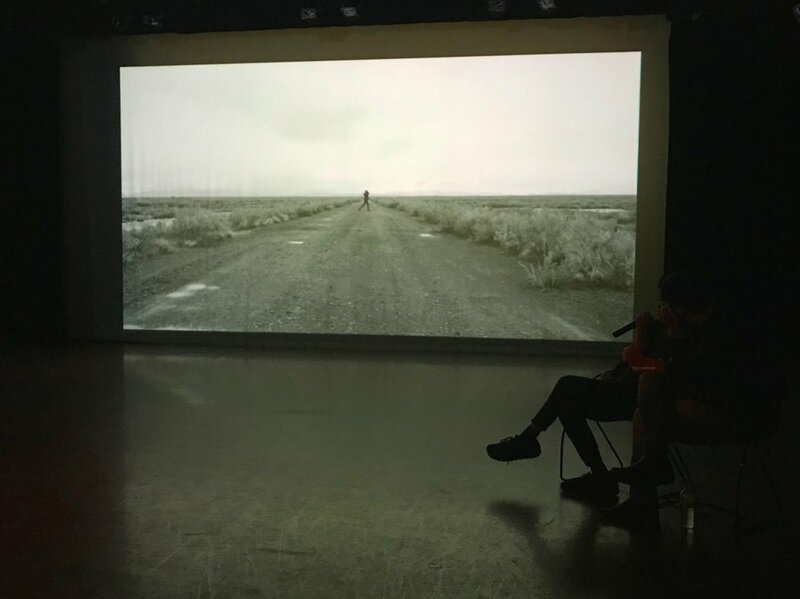 Kondo put himself in these videos to express that he is directly connected to the history of his grandfather, which had an effect on his own identity. The past interacts with the present, he said. Kondo in San Francisco where his great-grandfather lived before being forced to Topaz internment camp. Kondo finds the house his great-grandfather took a picture in front of. In retracing his great-grandfather’s steps, he felt that it was important to return to the place where his great-grandfather was interned. With his great-grandfather’s cane, one that was created in the internment camp, he headed to Topaz. But while he was there, he started thinking about the effects of the war and all the people who were interned there. “I became quite emotional and felt the need to swing it around. I accidentally ended up breaking the cane,” Kondo said. Kondo visited Topaz internment camp to see where his grandfather had stayed and felt emotional at the thought of all those who were interned. When the exhibition was shown, people in LA had a good understanding of the history, Kondo said. In Berlin viewers tended to related the experience to the Holocaust. But, in Japan, the general understanding of what happened to the Japanese in America during World War II was relatively weaker. Some people felt that those who were interned were the ones who had chosen to leave Japan, and were therefore considered gone from the Japanese nation. Kondo plans to explore the relationship between the U.S. and Japan post World War II and the larger issues of Japanese modernity for his next project.